"The Cave" bookshelf by Japanese furniture designer Sakura Adachi offers booklovers a comfortable space in which they can really become one with their reading material. Originally from Aichi prefecture in Japan, 29-year-old Adachi is now based in Milan, Italy, and works for design firm Studio & Partners. 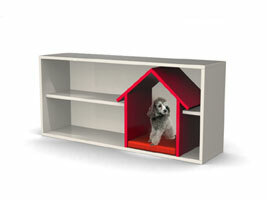 Her enticing bookshelf design, now available in smaller versions for kids and pets (pets can read... who knew?) is intended to provide a relaxing, comfortable environment for readers. Really get into your reading! "I wanted to create a situation like from your childhood," says Adachi. "Like when you're at home, hiding under the table, listening to your parents' conversation. That is a memorable experience that many people have." 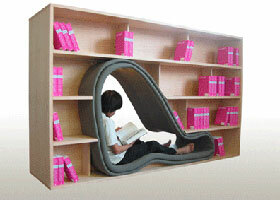 The pleasingly proportioned design acts as a room divider, allowing access to reading material from either side. Meanwhile, an integral reading lamp shines down upon anyone occupying the cozy, womb-like chair area. "The Cave" is a new design just recently put into production and current prices reflect that: 5,250 euros (about $7,045) for the large version and around $4,830 for the kid's version. Don't you think? Like a cocoon... Ahh. Maybe a little temperature control too, now that it's winter! Very neat idea. 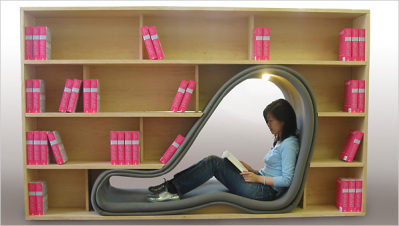 I love this and I really really really want one of the bookshelves with a cave. I would be in it all day. Well not all day but a lot. My only wish is that it were made of environmentally friendly material.